Although I have read about the ‘Law of Attraction’ from the books like Secret, Alchemist etc, I have never experienced it in my life until this happened. Rewinding back by around six months, my friend Abhash Kumar asked book recommendations from his network on Facebook. I was going through the comments to find any interesting books to read. 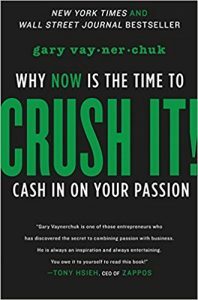 One of his friends commented ‘Crush It’ by Gary Vaynerchuk for which many had responded as to how Gary’s books were real gold. 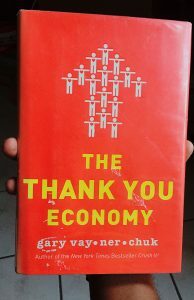 That was when I came to know about Gary Vaynerchuk for the first time (Ssshhh. Shame). I hit the library and brought home three of Gary’s books the next day and started reading them. I fell in love with his honest writing. I started following him on all his social media channels (he is everywhere) and listened to his podcasts for a while as well. More I read about him and watched his talks, I really wanted to listen to him in person and say thank you. 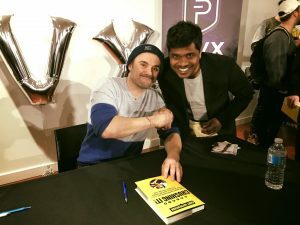 I put ‘ Meet Gary Vaynerchuk ‘ on my list of goals to strike off. I came across the video of Gary Vaynerchuk speaking at Niagara, Ontario in February 2017 (video below). I came to Canada in July 2017. Missed it by a few months. I came to know he was coming back again in February 2018 to speak in Toronto at Generation Now 2018. This was my opportunity. When the registrations opened, I checked the price of the tickets. It was around 150$ for a general admission. 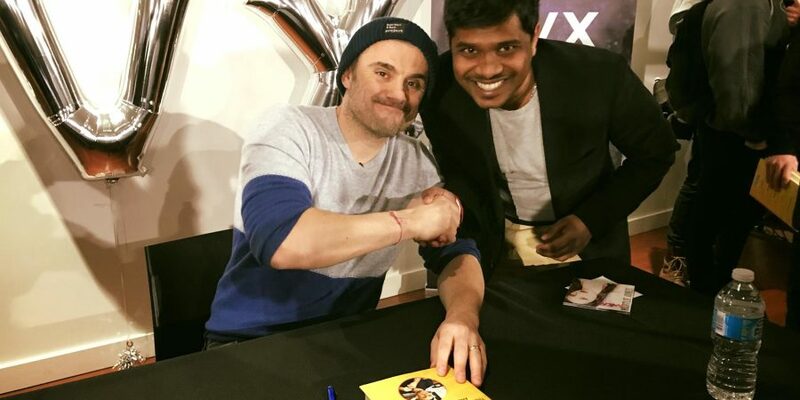 Around 500$ for VIP tickets which included a ‘meet and greet’ with GaryVee and his latest book ‘Crushing It’ with his autograph. I was waiting for my work permit then and I was contemplating whether I should spend money on the tickets when I did not even have a job. It’s like you really want to buy something that you love but at the same time, you don’t want to spend a lot on the same. What are the other ways to attend this conference? Every event needs volunteers and a conference of this magnitude will definitely need a lot of volunteers. I wasted no time and immediately found the organizer’s email and wrote an email expressing my interest in volunteering and quoting my previous volunteering experiences at conferences like Surge by Web Summit. Shauna Arnott is an amazing person and she is the brainchild behind super cool conferences like Haste & Hustle and Generation Now 2018. She responded positively saying that she hadn’t gotten to the volunteering part yet as the conference was months away but she assured she will keep me posted when it gets to that. There were a few meetups that happened in Toronto that raffled a pair of tickets (general admission). I tried my luck but I never got lucky there. Now we get to the part we are all waiting for. Interac was the title sponsor for the Generation Now 2018 conference and they announced a contest on “Future of Payments” and they were to pick 5 winners who will get an all-expense paid VIP ticket for the conference. This entailed a video pitch predicting how the future of payments is going to be (excluding mobile wallets and cryptocurrencies). I had ideas but I was contemplating if I should put myself before a camera and do it. The last day to submit the entry was November 17 and needless to say, I finally made up my mind and did a couple of takes to get this one below on November 17. I did not really think it would be picked until Shauna called me after three weeks and broke the awesome news. I was one of the 5 winners. Here’s what I won as a part of the contest. I was on cloud nine. I had my profile go up on Generation Now’s website (still there) and their social media team featured me in one of their posts as well. When you really set your heart on something and take every measure that comes your way to reach that, the universe really does its part in bringing that to you on a platter. That’s a crispy post and nice video about Future Payments..
You’re very inspiring sundaresan. 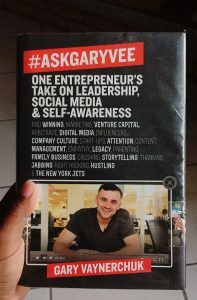 Garyvee has an infectious energy. Wishing you for the best and best to happen. Thanks Naveen for the wishes. Awesome. The law of attraction is something that i need to practice and has been putting it off for a long while. Glad you posted it now. It was my first time as well bro. Good luck with your efforts.